90-270V AC24V 20A top-of-the-range charger, which will perform perfectly on any mains supply world-wide (even on the worst marina supplies). Active power factor correction optimises the use of the available power and internal diode splitters for up to 4 batteries are built into the smart enclosure. Input voltage 90-270V AC. Unit is no longer in full production, we can though still offer a service and repair option. Please refer to our Support pages. 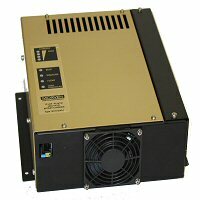 At VxI Power we believe that providing a power supply is a small part of our service to the customer. Our extensive battery knowledge and mechanical design capability enable us to provide turnkey solutions for your DC standby application. We have the on-site ability to supply all of the units we manufacture in a cabinet or rack.